Since Senator Edward Kennedy’s death, much has been said about his skill as a negotiator, his legislative triumphs, and personal qualities (as well as faults). But Jonathan Cohn, writing in The New Republic, identifies the key component of Kennedy’s reputation as the liberal lion. But Ted Kennedy was something else, too. He was a crusader. He was–again, to quote his fraternal eulogy–somebody “who saw wrong and tried to right it.” He possessed not just a clarity of purpose, but a certainty that his purpose had moral grounding. And that made Kennedy somewhat unusual, or at least quaint, in the part of the ideological universe he inhabited. Kennedy rarely made that mistake. When he looked at America, he saw a country full of people made vulnerable–by circumstance of birth, economic misfortune, illness, or injury. Some were middle-class; some were poor. In either case, he believed, we had an obligation, as a nation, to protect them–if not to render them whole, then at least to make them safe. And so he spoke out– for universal health care, for civil rights, for aid to people with disabilities, for more generous assistance to the poor. And when opponents criticized those moves, because they meant bigger government or bigger taxes, Kennedy didn’t deny the charge. He justified it, in a way few Democrats would dare do today. It was, he said, the way Americans fulfill their duty to one another. I think this is exactly right. 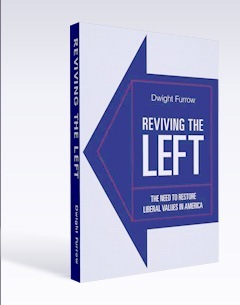 As I argued in Reviving the Left, liberals made crucial errors in not casting their arguments in moral terms in the period from the mid 1970’s-2000, allowing the right to occupy the moral ground without a challenge. But Kennedy never lost that moral focus. Despite the many compromises he had to make on legislation he seldom was guilty of making the “conservative-light” arguments that characterized Democratic campaigns for many years. It is not yet clear whether liberals have learned that lesson. Obama occasionally uses moral rhetoric but typically allows that focus to fall from sight. In the fight for health care–and, perhaps, the broader liberal agenda–this sense of moral purpose has waned. It’s inefficient to spend 16 percent of gross domestic product on health care. But it’s an affront to our basic sense of decency that almost any American can lose his savings, his home, or even his life because he doesn’t have the right insurance policy–or perhaps because he doesn’t have any policy at all. Democrats tend to get lost in the policy details without bringing the discussion back to the fundamental moral claims that move people. Posted by Dwight Furrow in Dwight Furrow's Posts, Message in a Bottle.